Since then, we’ve barely made it back to the moon, antibiotics have lead to the rise of superbugs, and people are so afraid of nuclear fallout that some nuclear reactors are being closed. What if these roadblocks weren’t intentional? What if someone was trying to keep the human race from discovering these disruptive technological advancements? Such is the premise of Daniel Suarez’s Influx, which centers around a government agency, the Bureau of Technology Control (henceforth BTC), whose mission is to protect the public from its own scientific ingenuity. Despite a killer premise and intriguing first quarter or so, Influx ends up squandering its impressively inventive opening with a mixture of subpar writing, unimaginative technology, flat characters, and cookie-cutter plot. After reading the synopsis and the first hundred or so pages, I probably had unrealistic expectations. While I didn’t exactly expect it to reach the heights of William Gibson’s Neuromancer, Influx seemed to be heading at least in the direction of a game-changing sci-fi novel. Suarez creates a world where anything should be possible, but then the uses of technology and the story beats end up being distressingly unimaginative. The most fearsome technology we see is directly out of Batman Begins. I don’t care how advanced or convoluted the explanation is, a gun that makes a super large bang is still a gun. A cannon that can blow a bigger hole in stuff is still a cannon. A super-advanced way to talk to each other is still basically radio. Suarez sets the stage for truly mind-warping technology, but then we just end up with really fancy versions of all of the same old stuff. It’s a let down. While I might have been disappointed with the technological vision in the book, Suarez does an excellent job explaining the technology that is there. He might go in a little too much technical detail at times (there’s at least one chapter that doesn’t need to exist because of it), but it’s clear he’s thought out exactly how all of these things work (with one or two leaps of scientific faith). He also sticks to his guns. At one point, characters become essentially able to fly by manipulating gravity, but Suarez insists on referring to it as changing the direction of their fall. They’re small details, but they really do bring the individual technologies alive, even if they might not be as visionary as I might have liked. With that being said, there are two or three very cool uses of the tech near the end of the book and a throwaway mention of a really cool technology at the end of the book. The novel also wastes the opportunity to meditate on some really interesting questions. The basic question of whether or not all technological advancement is good seems ripe for actual exploration, but the main character simply rejects it outright, the bad guys do truly heinous things, and we end up having to root for the main character just to beat evil people without really examining whether or not these technologies should exist. The novel would have gained a lot of depth, and maybe reached the level of a good imitation of Crichton, if Suarez had introduced a new technology whose benefits didn't necessary outweigh its negatives. There could have been some moral ambiguity and an actual examination of the themes instead of just setting up two sides to start hitting each other with various bits of technology. I will give Suarez credit for a hilarious use of artificial intelligence during the novel’s climax, where (spoilers!) the AI has to try to kill our heroes while helping them or face being shut down. The writing style itself is generally unremarkable and inoffensive, except for one possibly unfair pet-peeve that could easily be cleaned up in an editing pass or two. Nodding. Characters nod at everything all of the time. Suarez seems to use the action as a crutch just to add a sentence or two. There are multiple times when characters literally nod to no one or nothing in particular. During the last 50 pages I started counting and came up with two pages where various characters nod three times. Twice, the same character nods twice within four lines. Characters stop to nod to themselves while climactic action and general chaos ensues around them. It’s a stupid complaint, but my enjoyment of the last 200 pages would have been greatly enhanced if people just stopped nodding at everything all of the time. There’s also an overuse on Artificial Intelligence. While each individual use of AI makes sense, I was just so bored with them being mentioned by page 200 that the last few hundred pages were a slog. Again, where was the truly inventive technology? Where was the technology that could have existed if we’d had fusion since the 50s and quantum computing for 30 years? The novel also is littered with plot half-threads that don’t really end up going anywhere. There’s lip service to the examination of how clones can differ from their hosts, but it’s never examined in any depth. One character is genetically engineered to be essentially perfect and there’s not any examination of the mental toll that might take except for her being sad she can’t have kids. 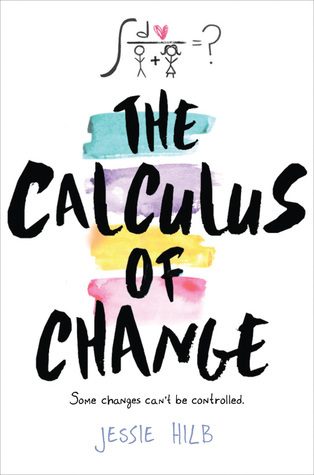 The main character is synesthetic, which should make the novel replete with how the stars sound like Chopin or how his technology tastes like the color green, but instead we get four or five mentions of it while it’s used as an excuse for his big breakthrough, but it’s otherwise unmentioned. I actually forgot he was synesthetic for about 150 pages. The novel is from a third person limited point of view of his character and you’d never know he sees light in sound or smells the sensation of flying by the way the novel’s written. It’s just another wasted opportunity. 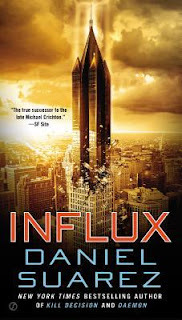 Despite all of the above complains, Influx is not a bad novel, but it is a disappointing one. Some of that is definitely my expectations, but it’s also the result of the first hundred pages or so. The premise and the set up of the novel promise a truly mind-bending book. Instead, we get a fairly by-the-numbers, obviously good and uninteresting good guy vs. evil-just-because bad guy plot where the resolution is the same old action trope of shooting and punching things. It’s not bad, but when you expect an A, getting a pretty good airplane read is a bit disappointing.